"ACT UP is the most successful grass roots organization that ever lived. Period. There never was, never has been one more successful that has achieved as much as we. We did it before. We can do it again. But to be successful, activism must be practiced every day. By a lot of people. It made us proud once. It united us." - Author, GMHC and ACT-UP co-founder (and my hero), Larry Kramer, calling for a new "ACT-UP Army" in a speech last night to the NYC Gay & Lesbian Center marking the 20th anniversary of ACT-UP. Read the entire text of Kramer's speech here, courtesy of the tireless Andy Towle. There will be a 20th anniversary ACT-UP march on March 29th. 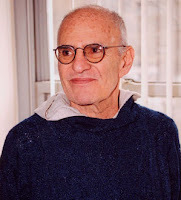 If you are a gay man reading this post, you may very well owe your life to Larry Kramer. I know I do. You definitely owe him the lives of many of your friends. The life expectancy after infection by HIV is now thirty-five years. Thirty five years. Can you imagine that? That is because of ACT UP. A bunch of kids who learned how to launch street actions and release a propaganda machine and manipulate media masterfully, and use naked coercion, occasional litigations, and adept behind-the-scenes maneuverings that led to sweeping institutional changes with vast ramifications. We drove the creation of hundreds of AIDS service organizations across the country, leveraging hundreds of millions of dollars a year and fielding tens of thousands of volunteers, all the while amassing a huge body of clinical expertise and moral authority unprecedented among any group of patients and advocates in medical history. Please join Larry Kramer on March 29th on the march to City Hall demanding health care for all, single-payer health insurance, and drug price controls. You owe it to Larry Kramer. You owe it to your dead friends. But most importantly, you owe it to your living ones. UPDATE: Here is the Danish study that Kramer references, which finds that with free and early access to anti-retrovirals, a young person can expect to live 35 years after HIV infection.